Spatial vision relies on a spatial coding of object directions sensed by the retinal photoreceptors. An empirically measured constant error in this coding of perceived space is described classically as a barrel distortion involving long horizontal lines. A Cartesian retinal coordinate system is constructed to describe the transformation from object space to perceived space. This system establishes a subjective horizontal and vertical (isoelevation and isoazimuth) grid for each eye. The retinal entities that mediate subjective sense of constant elevation (horizontal) and constant azimuth (vertical) constitute the functional division of the retina, and they are described by a model with a single parameter zp, which determines the curvatures of a set of hyperbolic isopters. Empirical isoelevation positions were measured, which were described by this model. The best-fitting zp values appeared to be independent of viewing distance, similar for the two eyes of the same observer but differing significantly among observers. The functional-retinal-division model and horizontal retinal shear, as described by Helmholtz, were used to predict the spatial distributions of binocular corresponding points. The disparity field on a frontoparallel plane at a finite viewing distance showed marked asymmetry between the upper and the lower visual fields. The hyperbolic isoelevation and isoazimuth curves dramatically exaggerated this asymmetry. 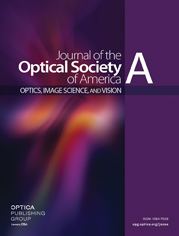 This theoretical disparity field provides a guideline for experiments that attempt to show the effect of binocular disparity in the periphery.